I am going to make a post outside of my usual theme to share a couple of crafts I have made for my daughter. We are about to embark on our annual trip to the States (4hr. train ride and 17hr. plane ride) and I am always looking for ways to keep her entertained that do not involve a screen. I usually bend my 30 min./day max of program viewing on the plane and allow her to watch as many of her pre-approved shows as she would like but I really try to have other options for her as well. Traveling such a long way (and by myself) with her can make for very heavy carry-ons so, electronic devices really are the easier way to go as you can contain so much in one unit. We bought a Nook 2 years ago to cut back on the books that we have to carry and that has helped a lot. She takes after her mama in her love for books. These projects that I have made though only take up a little space in the bag and are relatively light. Last year I started sewing felt food for Violet to play with and have gradually tried to replace all the plastic food she was given. In my search of patterns for felt food I came across the idea of Quiet Books. I make mine out of felt and usually use the amazing free patterns created by Stephanie at Imagine Our Life. Her work is amazing and her patterns are extremely easy to follow. Violet adores playing with the ones I have made and I feel happy seeing her play with something that allows her to play imaginatively and creatively. After making a couple of her patterns I decided to try my hand at making my own patterns. I made my first patterns for a Birthday Themed book. It turned out so sweet and Violet was so surprised when she opened it. Then for Christmas I made a pattern and wrote a poem to go along with the pages. That one took me a pretty long time to make. I usually try to make a few handmade things before a trip to give her something new to open on the plane. I read that tip on a website to help occupy time on a long trip. Last summer, I wrapped each thing in a thin cloth instead of wrapping paper and she found that really exciting too. 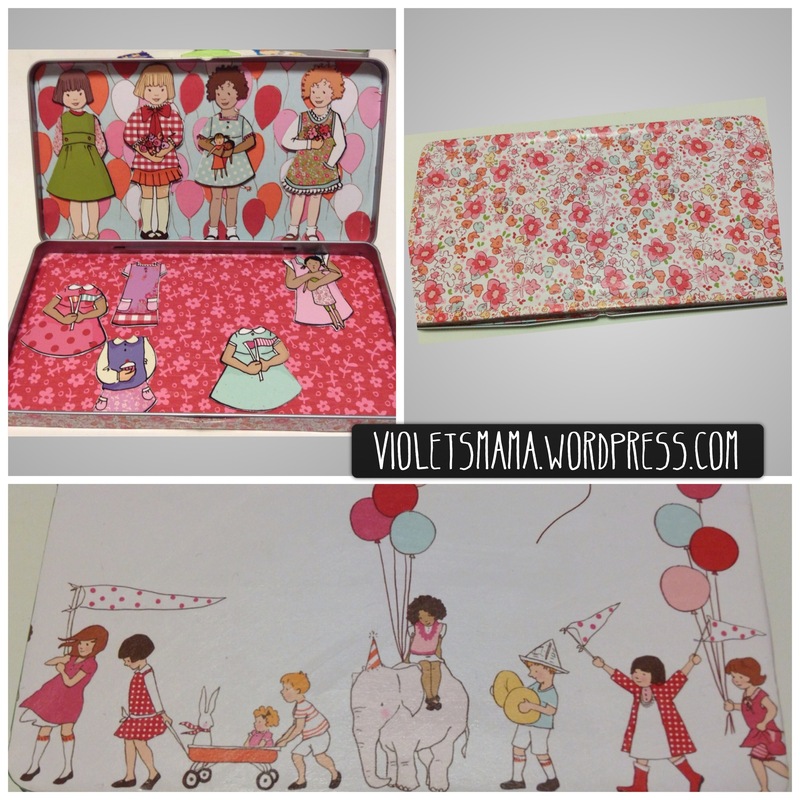 This year I have been inspired by the adorable fabric designed by Sarah Jane Studios. Her illustrations are so sweet and whimsical. I have sewn a few dresses for Violet with the fabric too. Sarah also has paper doll designs. You can buy them online and then download them to your computer to print out as you like. I ordered the whole set. I decided to print some of mine out on magnetic paper and some on printable fabric. Here is what I did with them. I had originally hoped to do them all in fabric and make quiet book backgrounds for each theme for her to play with them in but we had to reschedule our trip and we are leaving earlier than expected now. That being said, I didn’t have time to sew all the backgrounds. Instead, I decided to draw them in an app called Paper and then I printed them out on sticker paper and adhered them to the inside of a little tin that used to house crayons. It works perfectly. All the dolls are contained in the box and she can make up her own stories to play with them within the scenes I drew for her. I am not an artist by any means so please don’t judge me too harshly when you see my ridiculous drawings….especially the Eiffel tower. I know the scale is off compared to the dolls but I drew them for my daughter and I know she will appreciate them, even if they look like a child drew them. Actually all the better I think. I hope that I am showing her you don’t have to be perfect at everything. You can enjoy doing something even if it is not something that others perceive you as doing well. And here is the set I made with her Children at Play dolls. This set, I bought pre-printed from a craft store online. They are on a heavy weight paper so I decoupaged them onto magnets. 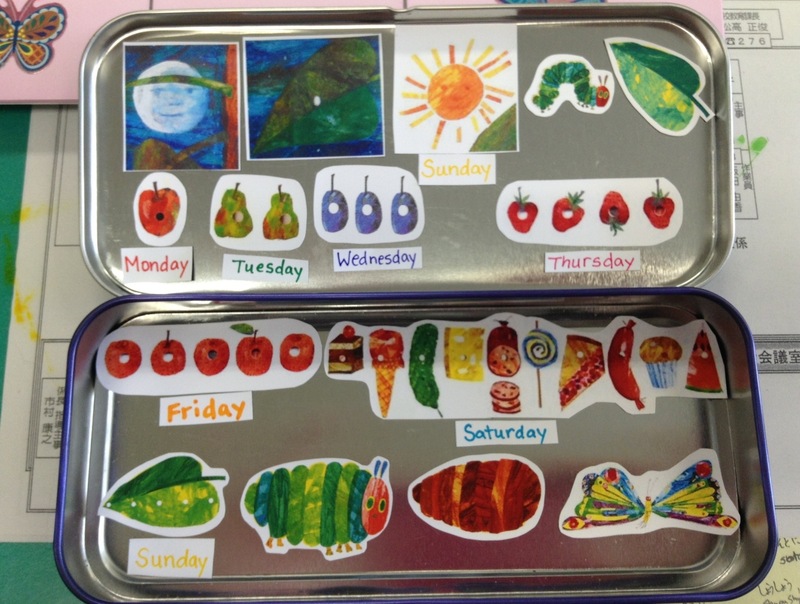 The tin is from some pencils she was given. I decoupaged some scrapbook paper to the outside and inside. The paper is also from the Sarah Jane Children at Play series. 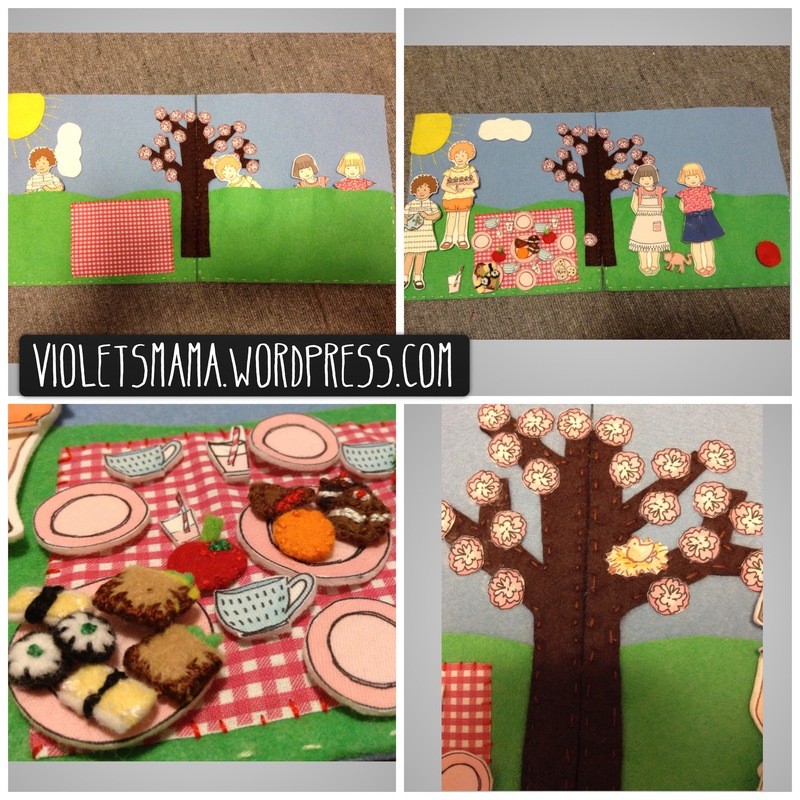 For the Tea Time Picnic set I was able to make the felt book background. I was pleased with how it turned out. I imagine it will be hard to keep track of all the pieces though….. And the little bitty small pieces of food were a bit tedious to make but they didn’t take long. My favorite are the tiny pieces of sushi. 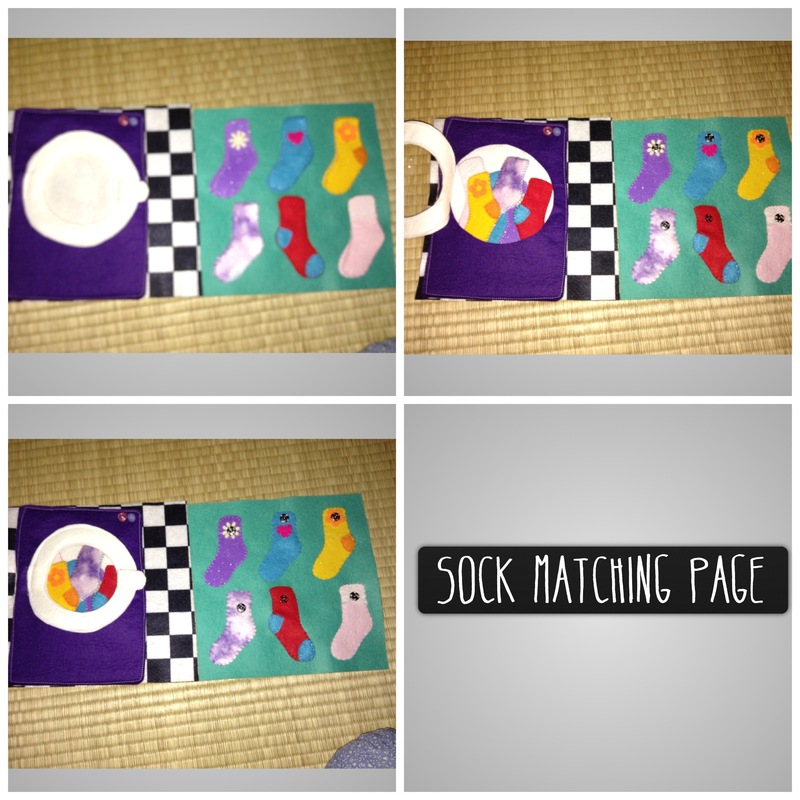 The last thing I made was Stephanie’s Sock Matching page. It is fun and Violet loves things with snaps. Well, that’s it for now. I just wanted to share some easy things to make for your kids. I know it is off my usual topic and I apologize to those readers who are not at all interested in crafts. I’ll be back to blogging about breastfeeding and parenting next time. 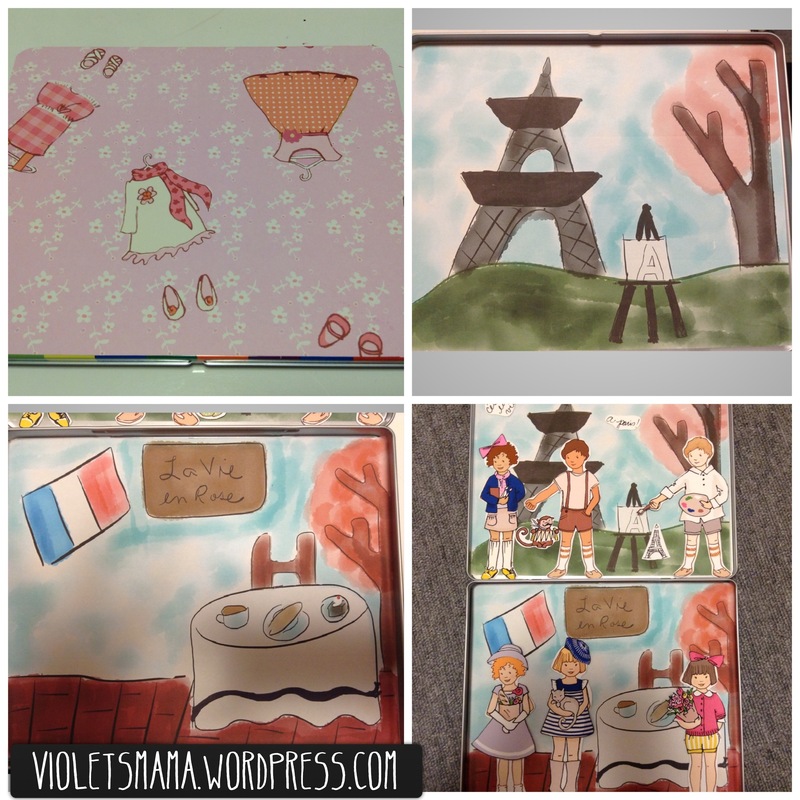 This entry was posted in Crafts and tagged crafts, DIY activities, felt, motherhood, paper dolls, parenting, quiet book, travel tips by violetsmama. Bookmark the permalink. You are awesome! I sit here thinking, how does she have time for all that? But perhaps if I pulled myself away from the TV or computer more, I’d have time for crafty things too 🙂 I love you, Mama! Awe thanks! Sometimes I stay up way too late! 😉 I always do my crafting after she is in bed, usually on the weekends. 🙂 I love you, Mama! S-You are amazing! What a great blog! Can’t wait to read more! LOVE, LOVE, LOVE these ideas!